Standard - $29.99 Only 8 left! Do you want to promote peace and love this Halloween? Want to take all of your friends on a trip back in time to the psychedelic era of the 60s? Well, then we’ve got the perfect costume for you. Check out this amazing Hippie Chick Costume. It’s as colorful as a rainbow and as inviting as a meadow full of flowers. You’ll be sure to spread plenty of good vibes with this trippy attire! This costume is both easy going and easy to toss on. Simply start with slipping into the cozy white cotton shirt and toss the floral-printed vest on over it. Then just pop on the matching floral-printed pants and you’ll look like you just got back from Woodstock. 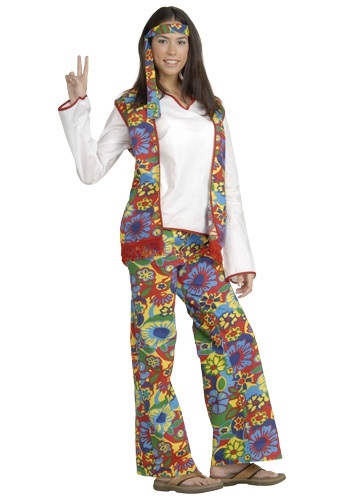 Take this hippie costume to the next level with a handful of accessories. We have plenty of fun 60s inspired jewelry and props available, so please do take a look. Grab yourself a fun and colorful headband, as well as the classic peace sign necklace, and the coolest pair of retro shades you can find. Then, just finish your trippy transformation with a pair of sandals or even some of our hippie moccasins. You’ll look like hippest hippie from the top of your headband to the soles of your shoes! Make everyone yell ‘far out’ when you enter the party scene this Halloween wearing this vibrant Hippie Chick Costume. Everyone will love the aura that surrounds you while you have this extremely relaxing attire on. Just be sure to study up on the hippie lingo and you’ll have tons of fun this Halloween!